As dive knives go- I prefer a heavier tool capable of prying when using SCUBA and those knives run $85 to $125. But I rarely wore my knife free-diving due to the weight. This is a good alternative, light weight solution. The sheath is a lighter weight material than most dive sheaths, but seems relatively durable despite the price. My only concern would be pin on the retaining latch, but mine seems to be holding up just fine. The knife is difficult to return to the sheath unless you are looking at it- I find it works best mounted on the arm instead of the leg when diving. The straps are a very similar rubber used on higher-end dive sheaths. The knife itself looks like a quality stainless steel and the finish is really nice. Nice, sturdy working serrations, but my knife really had no sharp edge when I received it. It sharpened up quickly though and holds a good edge. Great value for the price. It's exactly what I expected. Sharp out of the box, and the straps aren't complicated since they're just snap-fit buckles that are easy to adjust on your leg. Since the straps were rubber, I assumed it would be painful to wear on bare skin considering my leg hair. However, it's so comfortable, I forget I'm wearing it (I even wore to to bed last night). As stated, I'm not a diver, so I wrapped paracord around the handle. My only complaint is that I couldn't wrap it around the whole handle, as it wouldn't fit in the sheath. However that's user preference and doesn't bring down the knife itself. Great buy. 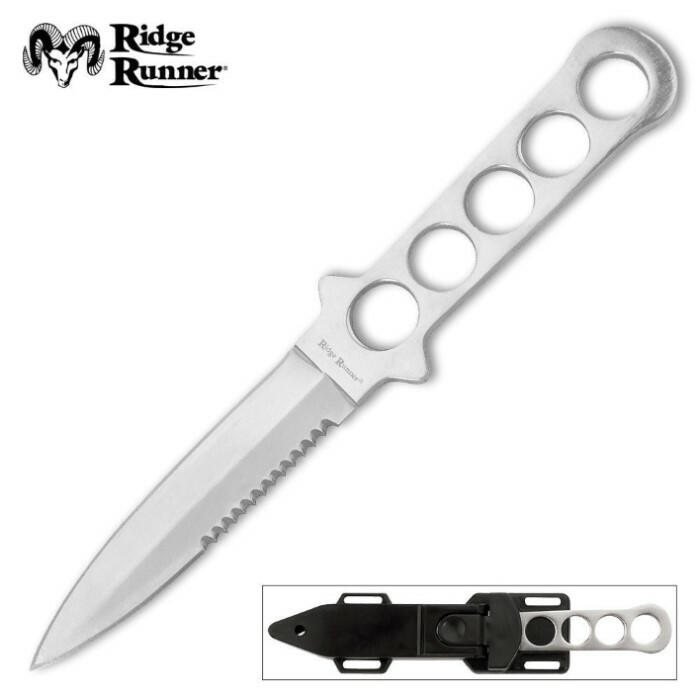 full piece of metal +1 little grip -1 corrosion resistant +1 possible cord wrap +1 serrated -1 possible double sided blade +1 finger holes for extra grip +1 total points 3... this knife did much better then most knifes out there, well done. most knifes would have negative points, honestly there is allot of bad knifes out there. the knife for the price is amazing. I bought mine on a bogo free shipping deal. You cant beat 2 knives and sheath for 10 bucks. i like the knife it works, im a surfer so i rock it every once in awhile. The sheath is plastic, very cheap but it works. its worth the price. The knife itself is great. It came sharp out of the box, and i have used it many many times. I had to modify the sheath a little to allow for an easier draw, but it was a very small modification. Overall, great knife. This knife is not the main reason I buy this set, although it is defiantly a plus. I dive under boats and clean out the props and I use the knife for prying rope out between the prop and the stuffing boxes. However the sheath also holds another knife that I use to cut rope. Very good rig folks!!! The quality of the knife is poor. The grinding of the blade did not match from one edge to the other. The sheath latch does not release without some wiggling. I just assumed that was why the knife was discounted. I will say everything else on my order was good. Well me and my friends like to go back to the river about a mile behind my house in the middle of nowhere and we really put our knives through some tough stuff. I use my bowie knife on land and this knife for the water! its pretty sharp and holds a good edge. I am not a huge fan of the sheath but i rarely am. the knife fits pretty well in the sheath and the leg straps are pretty nice but the knife rattles in the sheath when you walk with it strapped to your leg and thats not helpful in stealth operations but all in all its a fun tough knife that i take with me every time!